Welcome to the Bernese Oberland, where snowy alpine summits have been made accessible by a network of cogwheel trains and cable cars. Few regions have a beautiful mountain landscape, and in many less regions, this landscape is easily accessible. Something has to be done about that, they thought in the Switzerland of the 19th century. The Jungfraubahn was an idea of ​​Adolf Guyer-Zeller, born in an era in which his first name had no negative connotation. He wanted to make the beautiful panorama around the Mönch, Eiger and Jungfrau mountains accessible to everyone. It became a titanic work of 16 years. When the Jungfraujoch train station was taken into use in 1912, the construction team had built a cogwheel track over a length of 9 kilometers, while climbing 1400 vertical meters during the journey. The last seven kilometers of the track are laid in a tunnel straight through the rocks of the Eiger. The team used dynamite to blow its way step-by-step through the mountain. In 1899, six Italian workers were killed in an accident with explosives. After that, another 30 tons of dynamite stock exploded in the valley station, fortunately without casualties. 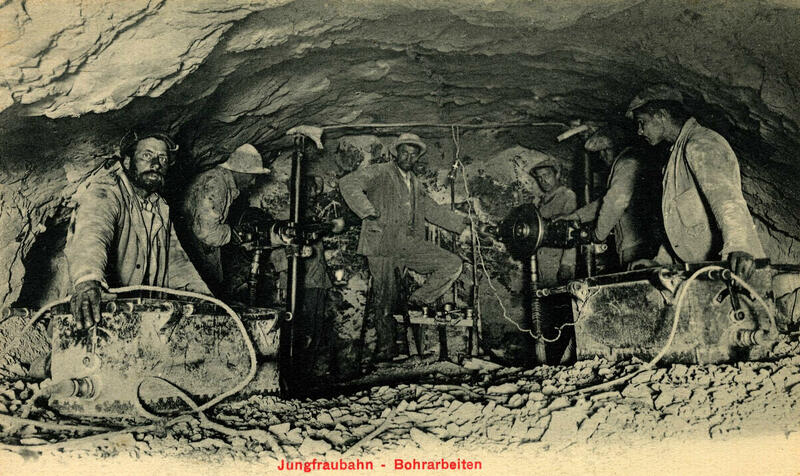 In February 1912 the team blasted trough the surface and after 13 long years in the tunnel the workers were finally able to work back in the daylight. On 1 August 1912 the station Jungfraujoch was taken into use as the highest station (3454 m) in Europe. The Jungfraubahn was a piece of top technology for its time. Not only was the railway completely electrified (a hydroelectric power station was built especially for this purpose at the Lütschine), it's also very energy efficient. The braking downhill trains are used to generate energy for the trains running uphill. The journey to the Jungfraujoch starts at the train station of Interlaken Ost. There the blue-yellow train of the Bernese Oberland Bahn (BOB) awaits us. As a traveler you have to choose: the first carriages drive to Lauterbrunnen, the last to Grindelwald. Ultimately, it doesn't matter what you choose, since both in Lauterbrunnen and Grindelwald there is the possibility to switch to the lines of the Wengernalpbahn (WAB) which takes us further uphill. The route begins relatively flat through the valley from Interlaken Ost across Wilderswil to Zweilütschinen along the swirling meltwater of a mountain river. In Zweilütschinen the route splits up to Lauterbrunnen or Grindelwald. Here we also find the workshop of the BOB. The route to Lauterbrunnen goes up with a cogwheel with a maximum slope of 96%. The route to Grindelwald is slightly steeper with a maximum slope of 120%. It is clearly audible in the train when the cog-wheel system is switched on. We drive up via Grindelwald and return via Lauterbrunnen. After arriving in Grindelwald, you have a few minutes to change to the yellow-green carriages of the Wengernalpbahn (WAB) which connects Grindelwald (1064m) with Lauterbrunnen (870m) over Kleine Scheidegg (2200m). If you travel from Grindelwald to the top, be sure to sit on the right side of the carriage to have the best view. You enjoy beautiful views of the village with the mountain tops in the background. As we continue to rise, the vegetation gradually makes way for alpine meadows when we reach the tree line. Eventually you arrive at Kleine Scheidegg. Walk straight to the back on the platform, where the queue starts for the Jungfraubahn. As soon as the train leaves you have a nice view of the Eiger (go sit on the right side again) until after 2 kilometers we enter the tunnel. From then on you see nothing but a dark tunnel. Halfway through the tunnel, the train stops at Eismeer station for 5 minutes. Be sure to step ou and go to one of the panoramic windows to take a look at the rough ice mass of the Grindelwald-Fieschergletscher. Here the track also runs double, so that the downward train can pass the ascending train while it halts here. Eventually the train arrives at the highest station in Europe: the Jungfraujoch. This is the lowest point on the ridge between the summits of the Mönch and the Jungfrau. Starting from the station there is an underground tunnel network with various sights. The first stop is the elevator to the Sphinx Observatory. It is named after the Sphinx, a rocky mountain peak on which the structure is located. The observatory is located at 3,571 meters and is one of the highest observatories in the world. The lift bridges about 120m in 25 seconds, making it the fastest lift in Switzerland. From the panorama roof of the observatory you have a great view of the Aletsch glacier and the peaks of the Mönch, the Eiger and the Jungfrau. Back down we continue our way through the tunnel to arrive just above the glacier. From this exit, a well-prepared path starts from March to October to the Mönchsjochhütte refuge (3650 m). You reach the hut after a 45 minute hike. Back in the tunnel there is an alpine exhibition with typical wooden figures and a gigantic "snow globe". This is the place to be for the many selfie-addicted Japanese and Chinese tourists. After this intermezzo we arrive at the ice palace: a tunnel of several hundred meters long through the ice mass of the glacier, including some caves with ice sculptures. Because the tunnels are located in the rocks of the ridge and the ice palace moves with the glacier, the entrance and exit have to be shifted a few centimeters each year. Due to the many tourists, the ice threatened to melt, so now the temperature is kept constant at -3 ° C by cooling machines. Afterwards we are back in the station and we can start the journey downhill. Once we are back in Kleine Scheidegg we get on the Wengernalpbahn again, this time towards Lauterbrunnen. Over a length of 5 km, the narrow valley in which our destination is located is surrounded on both sides by 600 m high, vertical rock walls over which mountain streams fall into the depth. The most beautiful waterfall is undoubtedly that of the Staubbach near the village center. The waterfall is so high that its water curtain is blown by the wind up to a 30m perimeter. Through a carved staircase you can walk behind the waterfall, so take a raincoat with you. A little further down the valley we find the Trümmelbach, a combination of several waterfalls that have carved their way down into a cave in the mountain wall. The abrasive effect of the glacier water full of sand and stones is so strong that a 100m high sloping lift had to be built for access to the site. Custom lighting provides a nice color play in this water theater. After all this water spectacle you have the choice: either take the train back to Interlaken, or the cable car to Piz Gloria.